SolarPower: good for now or tomorrow? At this moment 40% of 2016 registered cars are electric vehicles (EV’s) in Norway. The country has a higher number of all electric battery only cars: more than 100.000. On the second place stands the Netherlands, which intends to phase out all fossil fuel powered automobiles by 2025. Although 0,2% of the global car fleet are a hybrid or EV’s, this transportation technology is here to stay. Global EV sales rose to 30% in 2016 compared to the previous year. It works as follows: When you push on the pedal it sends a signal to two potentio metres, which delivers it to the controller. The controller reads the petentic metres and the controller converts DC volts from the batteries to AC volt. In this article we explore why companies invest in electronic cars, why they choose for electricity and which hurdles are being crossed. 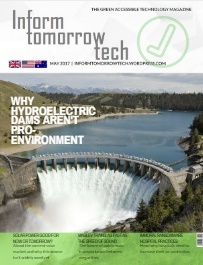 InformTomorrowTech believes that technology can be a solution for a greener earth. Writing accessible articles 1-2 times a month about current major technological developments. Don't forget, if you would like to receive the latest articles: Click down below. Magazine is out now! Subscribe to get it.